Bob Martin Double Action Spot On Solution for large dogs (10-25kg) is easy to use and has a specially developed formulation that acts quickly to kill fleas on your pet, and target flea larvae in the pet's immediate home surroundings. It is this Double Action that makes the product effective in protecting your pet from fleas. 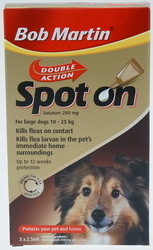 Effective and gentle - Bob Martin Double Action Spot On can be used on puppies from 8 weeks of age. Each treatment will protect your pet from fleas for up to 4 weeks. 3 tubes per pack, suitable for dogs between 10-25kg.